The ways of life of four great ancient civilizations-- Egyptian, Greek, Roman, and Celtic--are illuminated here through their foodways. As these cultures moved toward settled agriculture, a time of experimentation and learning began. Cities emerged, and with them consumer societies that needed to be supplied. Food Culture in the Ancient World draws on writings of classical authors such as Petronius, Galen, and Cato, as well as on archeological findings, to present intimate insight into ancient peoples. This volume will be indispensable as it complements classical history, cultural, and literature studies at the high school and college levels and will also inform the general reader. The book begins with an overview of the civilizations and their agricultural practices and trade. A full discussion of available foodstuffs describes the discovery, emergence, usage, and appraisals of a host of ingredients. A subsequent chapter covers food by civilization. Chapters on food preparation, the food professions, and eating habits provide a fascinating look at the social structure, with slaves and women preparing and serving food. Accounts of the gatherings of slaves and freedmen in taverns, inns, and bars and the notorious banquet, symposium, feast, and convivium of the elite are particularly intriguing and crucial to understanding male society. 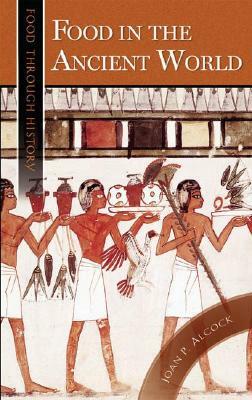 Other aspects of ancient life brought to life for the reader include food for soldiers, food in religious and funerary practices, and concepts of diet and nutrition. Many Classical recipes are interspersed with the text, along with illustrations. Joan P. Alcock is an archeologist and historian and an Honorary Fellow of London South Bank University and a Fellow of the Society of Antiquaries of London. She is the author of Life in Roman Britain (1996) and Food in Roman Britain (2001), among other works.